Members of Team USA's World Championships ski mountaineering team, including many Summit County locals, pose for a photograph during last week's International Ski Mountaineering Federation World Championships event in Villars sur-Ollon, Switzerland. The International Ski Mountaineering Federation’s World Championships concluded on Saturday in Villars sur-Ollon, Switzerland, but not before Summit County’s Nikki LaRochelle skied to a finish in the top half of the women’s team race. On Friday, LaRochelle paired with Aspen resident Jessie Young to cross the finish line with a time of one hour, eight minutes and 47 seconds, good enough for seventh place of the 16 pairs of women’s teams from nine different countries. LaRochelle and Young’s finish was the strongest of the several American teams with Summit County locals who competed in Friday’s team competition and Saturday’s relay competition. Summit County locals and longtime friends Sierra Anderson and Kate Zander raced to a time of 01:12:03 in Friday’s team competition, which put them in 11th place. Breckenridge local Jaime Brede teamed with Chelsee Pummel of Bozeman, Montana for a 13th-place finish (01:15:31), while the final American team of Sarah Cookler and Michela Adrian took 14th place (01:16:37). The race was won by the French team of Lorna Bonnel and Axelle Gachet Mollaret, in a time of 01:01:27. Friday’s team race competition followed a break in the action on Thursday after the sprint, individual and vertical races were held earlier in the week. In the men’s team competition, the top American team was John Gaston and Cameron Smith. The duo skied to a very strong showing of eighth place in the 27-team event, finishing up in 53:35. Other American finishers included Jason Dorais and Rory Kelly (14th, 57:27), Max Taam and Tom Goth (20th, 59:18) and Jon Brown and Jack Linehan (22nd, 01:0240). The race was won by the Swiss duo of Werner Marti and Remi Bonnet (50:37). Summit County’s ski mountaineers finished up their competitive time in Switzerland with Saturday’s relay race events. Anderson and Zander paired with Young to represent Team USA in the seven-team women’s relay competition. The trio finished in fifth place with a combined time of 30:17, ahead of Russia and Canada. The race was won by the French team of Lena Bonnel, Lorna Bonnel and Axelle Gachet Mollaret, in a time of 25:49. Saturday’s relay events combined cadet-aged (17-and-under) and junior-aged (18-20) athletes for one big co-ed youth competition. Team USA was represented in the competition by Summit County locals Grace Staberg and Max Bonenberger as well as Jacob Dewey of Gunnison. The trio’s combined time of 30:56 placed them ahead of both Slovakia and China. The race was won by the Swiss team of Robin Bussard, Patrick Perreten and Caroline Ulrich, who combined for a time of 24:51. Team USA also raced well in the men’s relay competition, which featured four-skier teams. The American foursome was comprised of Dorais, Gaston, Smith and Taam, who completed the event with a combined time of 30:45. That earned them a sixth place finish, ahead of teams from Andorra, Romania, Canada and Japan. The competition was won by the Italian foursome of Robert Antonioli, Nadir Maguet, Michele Boscacci and Nicolo Ernesto Canclini (27:21). In the World Championships’ overall nation rankings, Team USA finished in seventh place of a dozen nations. As for the cadet age-group division nation rankings, Team USA now ranks in fifth place in the world behind Switzerland, Italy, France and Spain. 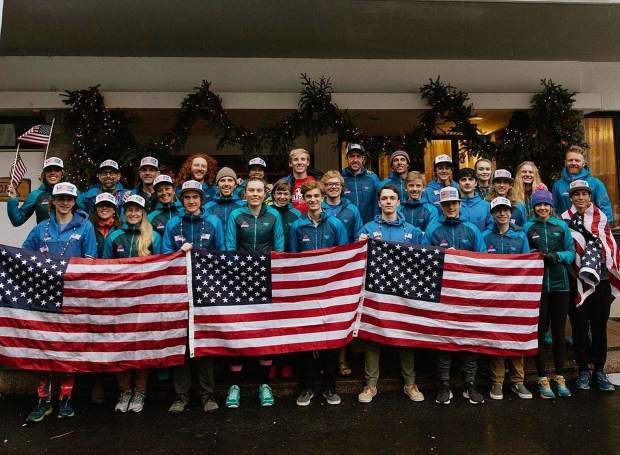 Team USA’s fifth-place ranking effectively means they now have added two more individual spots to represent the country in ski mountaineering at the 2020 Youth Winter Olympic Games next January in Laussane, Switzerland. The sport will be making its debut at the games, as governing body officials here in the U.S. and internationally are hopefully ski mountaineering will eventually join the official list of sports at the Winter Olympic Games.